The chimney where the burglar apparently died after a fire was started. FRESNO COUNTY, CALIF. — A suspected burglar who became stuck in a chimney in Central California died Saturday afternoon after the unsuspecting homeowner lit a fire, the Fresno County Sheriff’s Office said. The incident occurred at around 3 p.m. and firefighters who responded to the Huron home found a man stuck in the chimney but apparently still breathing, the sheriff’s office said. But the man, who was not immediately identified, was dead when firefighters broke into the chimney, the sheriff’s office said. The sheriff’s office said when the homeowner lit the fire, he heard a man yell from inside the chimney and the house began filling with smoke. The homeowner put out the fire and firefighters were called. 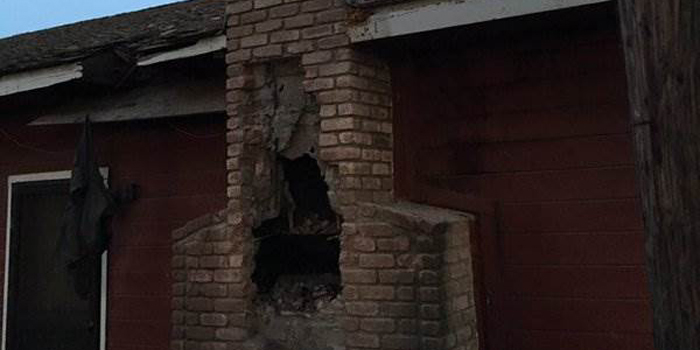 The sheriff’s office said its investigation indicates the man tried to enter the home through the chimney overnight and got stuck, and the homeowner, who was away and returned Saturday, didn’t know anyone was inside until lighting the fire. “I’ve been a deputy for almost 17 years now, and I’ve never seen anything like this,” Fresno County sheriff’s Deputy Jake Jensen told NBC affiliate KSEE. The Fresno County coroner will determine the man’s cause of death.